reform is a python-based command line tool that allows for fast, easy and robust editing of reference genome sequence and annotation files. 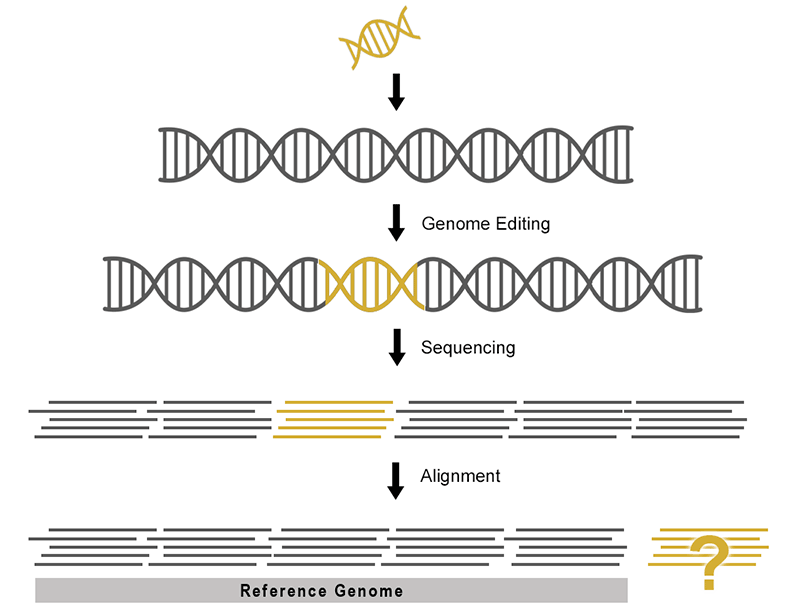 With the increase in use of genome editing tools such as CRISPR/Cas9, and the use of reference genome based analyses, the ability to edit existing reference genome sequences and annotations to include novel sequences and features (e.g. transgenes, markers) is increasingly necessary. 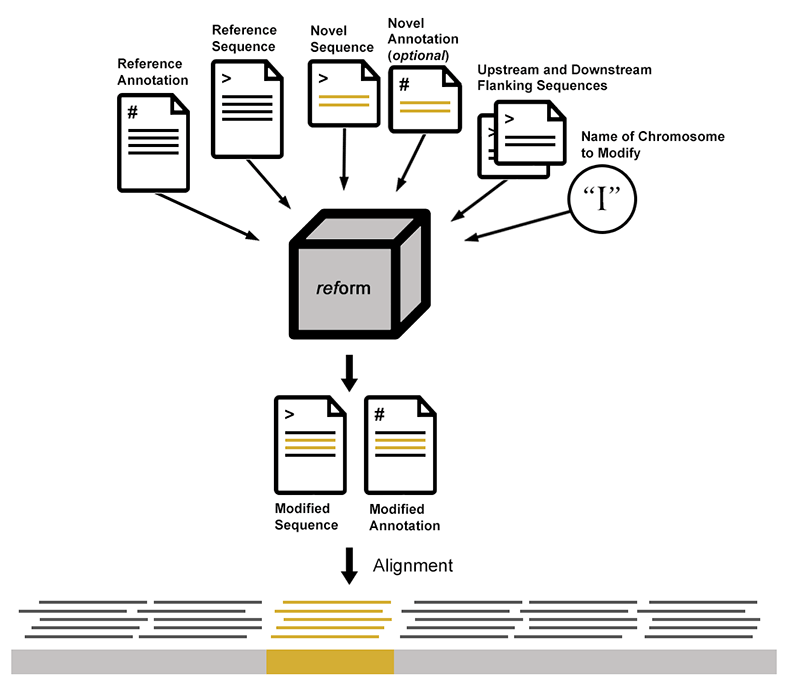 reform provides a fast, easy, reliable, and reproducible solution for creating modified reference genome data for use with standard analysis pipelines and the 10x Cell Ranger pipeline. While it is possible to edit reference sequences and annotations manually, the process is time consuming and prone to human error. Data that appears correct to the eye after manual editing may break strict file formatting rules rendering the data unusable during analysis. Execution of reform requires a reference sequence (fasta), reference annotation (GFF or GTF), the novel sequences to be added (fasta), and corresponding novel annotations (GFF or GTF). A user provides as arguments the name of the modified chromosome and either the position at which the novel sequence is inserted, or the upstream and downstream sequences flanking the novel sequences. This results in the addition and/or deletion of sequence from the reference in the modified fasta file. In addition to the novel annotations, any changes to the reference annotations that result from deleted or interrupted sequence are incorporated into the modified gff. Importantly, modified gff and fasta files include a record of the modifications. 1) Provide position at which to insert novel sequence. 2) Provide upstream and downstream flanking sequences, resulting in deletion of reference sequence between these two regions and addition of the novel sequence. reform requires Python3 and Biopython. position Position in chromosome at which to insert <in_fasta>. Can use -1 to add to end of chromosome. Note: Either position, or upstream AND downstream sequence must be provided. upsteam_fasta Path to Fasta file with upstream sequence. Note: Either position, or upstream AND downstream sequence must be provided. downsteam_fasta Path to Fasta file with downstream sequence. Note: Either position, or upstream AND downstream sequence must be provided. in_fasta Path to new sequence to be inserted into reference genome in fasta format. in_gff Path to GFF file describing new fasta sequence to be inserted. ref_fasta Path to reference fasta file. ref_gff Path to reference gff file. We’ll need the original reference in fasta format, and a fasta file containing the novel sequence to be incorporated into the reference sequence. We’ll also need the original reference GTF file, and a GTF file with the annotations corresponding to the novel sequence. We should have two new files reformed.fa and reformed.gtf which we’ll need in the next step.